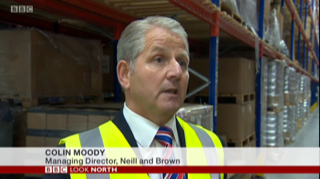 Our Managing Director, Colin Moody featured on Look North this week to discuss the implications that Brexit could have on the logistics and storage industry. We have already seen an increase in enquiries about storage from customers concerned about Brexit and possible problems it could cause in transporting goods. Neill and Brown have storage facilities at both the head office in Hessle and a purpose built site on Marfleet.